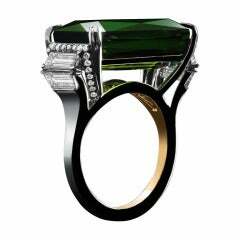 Superb 4.17 carat square emerald cut, vivid Green Tourmaline and 0.82 carat total round brilliant diamonds are hand set in this unique 8 claw prong cocktail platinum ring. This vibrant Green Tourmaline showcases superior color, cut and clarity. Crafted by extremely skilled hands at Merkaba Jewelry. Brand new and displaying rare beauty. Size 6. Resizing is complimentary upon request. ***Returns are accepted within 7 days of delivery and will gladly be paid by us. Rings resized upon request, may also be returned. Platinum Cocktail Rings.